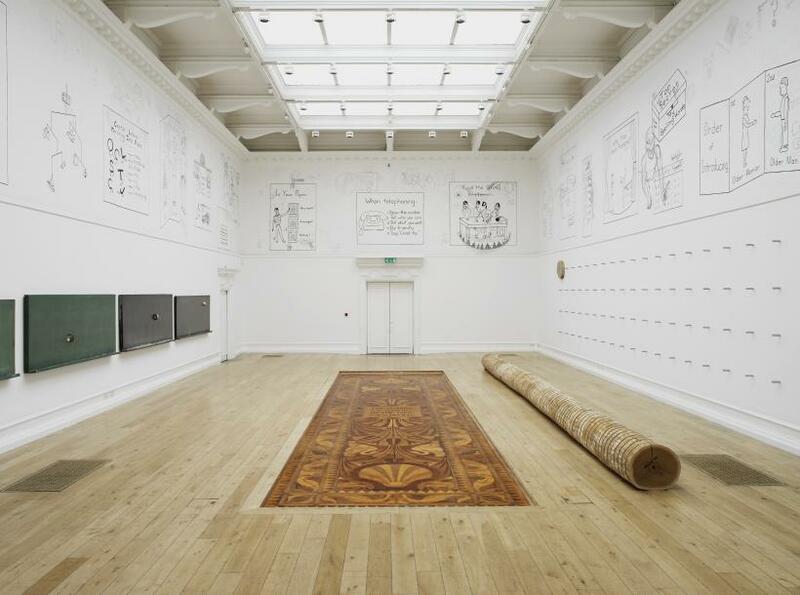 Title : Roman Ondak, The Source of Art is in the Life of a People, installation view at the South London Gallery, 2016.
Credit : Courtesy the artist, kurimanzutto, Esther Schipper, gb agency, Martin Janda. Photo Andy Keate. Title : Roman Ondak, The Source of Art is in the Life of a People, detail of Four Moon Phases, at the South London Gallery, 2016. Title : Roman Ondak, The Source of Art is in the Life of a People, detail of Event Horizon, at the South London Gallery, 2016. Looking at Roman Ondak’s exhibition I am reminded of the game I often play when confronted by a display of On Kawara’s ‘Date Paintings’. I scan first for my own birth date then try to spot other personally significant days. It is the natural reaction when confronted with a representation of a broad sweep of historical time to place our subjective standpoint within it. It is also reassuring to reflect that the randomness of dates and personal connections can confound the determinism of historical narratives – like the news of Aldous Huxley and C.S.Lewis dying on the same day being trumped by President Kennedy’s assassination. 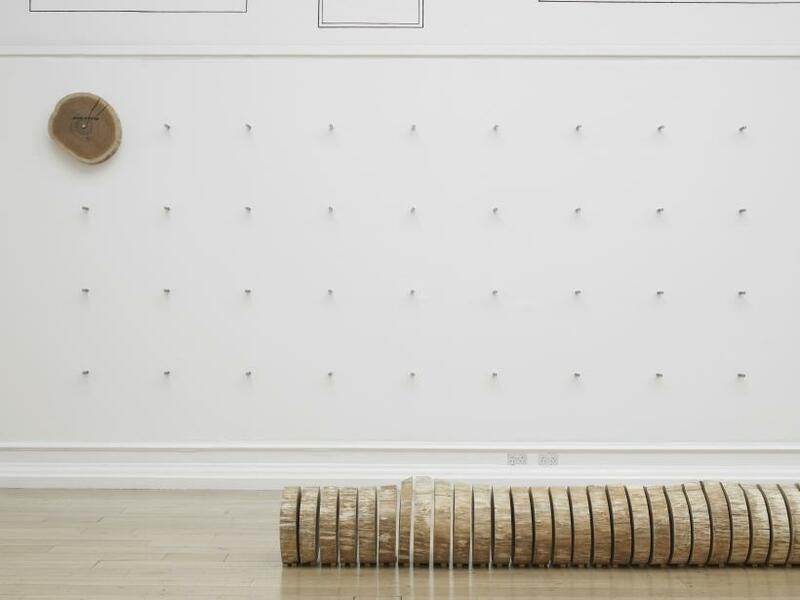 Time marches on in Ondak’s piece ‘Event Horizon’, a performance structure that rolls on over the duration of the 100 days of the exhibition at South London Gallery. A sliced up oak tree lies on the floor divided into 100 sections. Over the course of the exhibition, every day a piece is taken and placed on a grid of dowels mounted on the wall. Each of the tree sections has painted on to it text stating a significant event from each year. The list begins in 1917 with the Russian Revolution. The imposition of the text cuts across the lived history of the oak tree as revealed by its concentric growth rings. 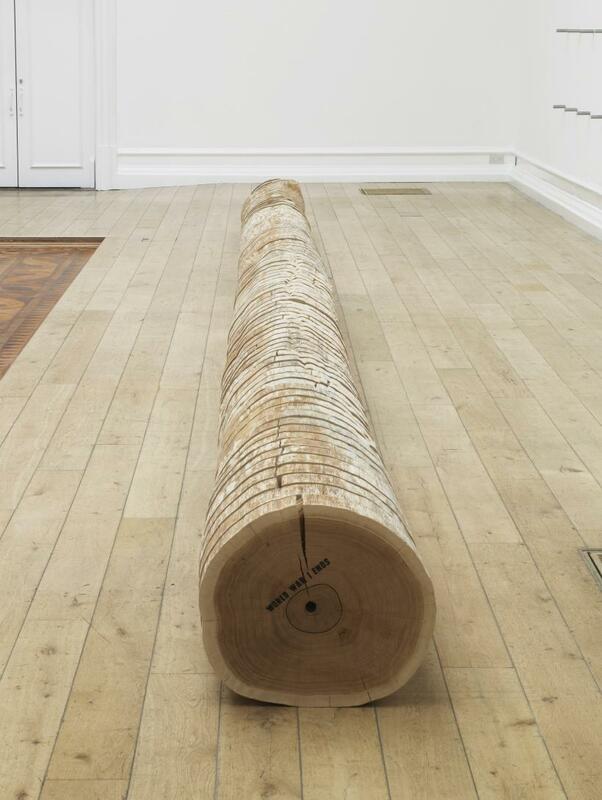 Here, the ‘natural order’ manages to complicate things as the tree sections continue to dry out in the gallery – splits and cracks in the tree widen out and cut through the text. 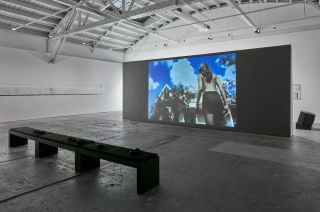 The seemingly fixed baseline ‘facts’ of Ondak’s timeline in ‘Event Horizon’ are shown to deform within the restricted timeframe of the work’s 100 days. In physics, the event horizon of a black hole is the point at which conventional observation of space time ceases. The choice of the key event of 1959 – when Fidel Castro took over Cuba – appears more significant in light of the announcement of his death, more so than the choice of ‘Great Depression hits Rock Bottom’ for 1932, as the extent of the current economic depression might even be greater. The publication of ‘Brave New World’ for 1932 feels more resonant. 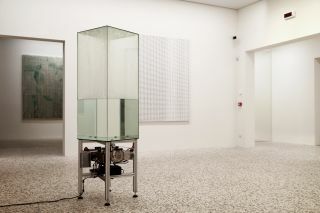 Ondak’s work has explored the tension between personal lived experience in the form of plants and political and cultural structures previously in the 2009 Venice Biennale installation ‘Loop’, through a meditation on biology versus ideology. 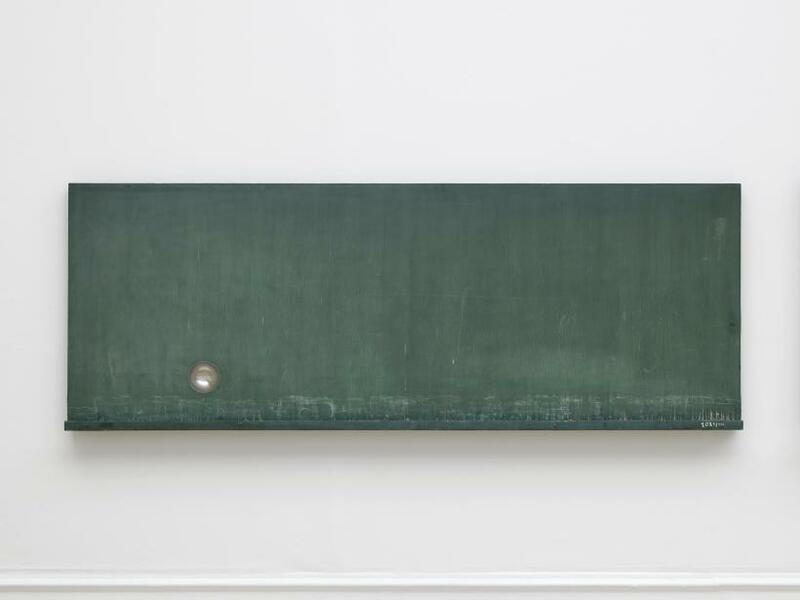 For a Slovakian artist having grown up through the varying fortunes of communist and socialist utopias and the collapse of the Eastern bloc system, Ondak’s concern chimes with many current anxieties. The hopeful immutability of art being tied to the transient concerns of life is encapsulated in Walter Crane’s marquetry floor panel, ‘The Source of Art is in the Life of the People’ (1891) that Ondak has uncovered and framed for the exhibition. 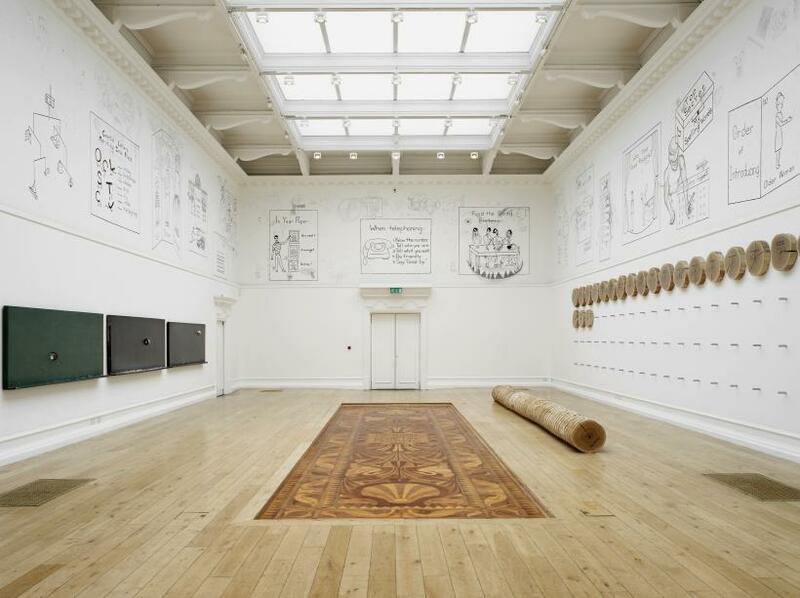 The irony is that Crane’s earnest Arts and Crafts English socialism, which appeared conservative in 1917 by comparison to European Avant-garde, now appears an aggressively radical statement out of step with the patron and donor boards that litter the gallery’s entrance. At the higher level around the gallery runs a temporary mural titled ‘Awesome Rules of Language’. 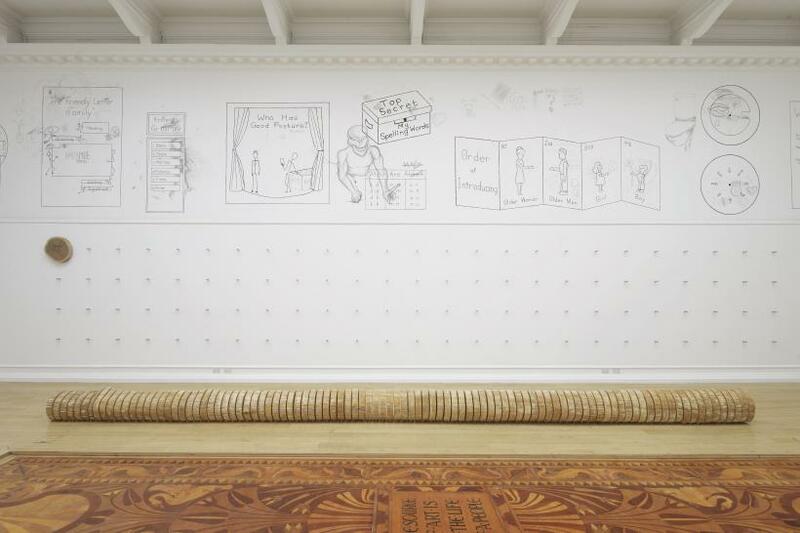 The work is based on a 1960s text book for children that includes instructions for social behaviour, while the formal cartoon illustrations have overlaying graffiti made by teenagers. 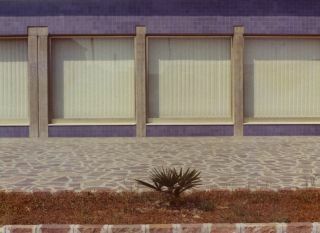 The wall piece, like the exposure of Crane’s manifesto flooring, is an archeological excavation by the artist of different periods and of the changing expectations of the potential of art and education to have a progressive or improving function for humanity. The mural occupies the same position in the architecture of the gallery as neo-classical friezes common in public-serving and educational establishments and implies the same function. The weight of history informs our current deliberations. Then, as now, it is a sham. The affirmations of the teenagers’ statements are more useful than moribund rules on etiquette. 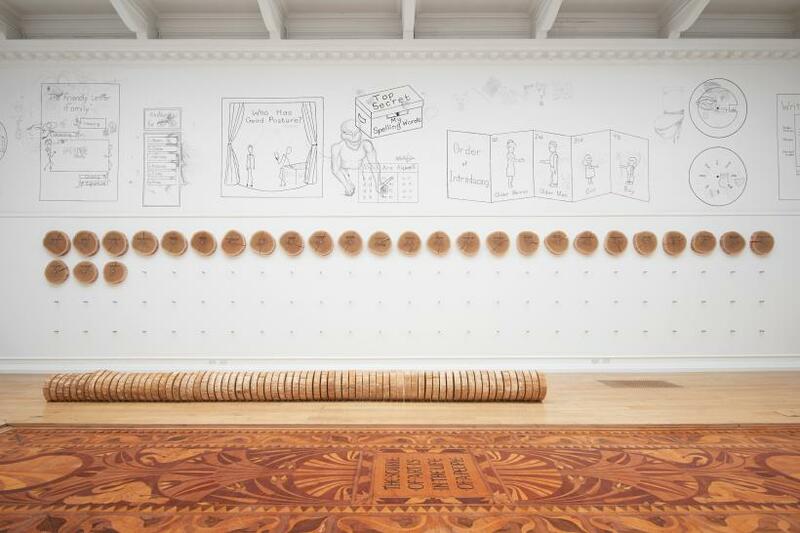 Ondak’s work draws in its own history and on art history. 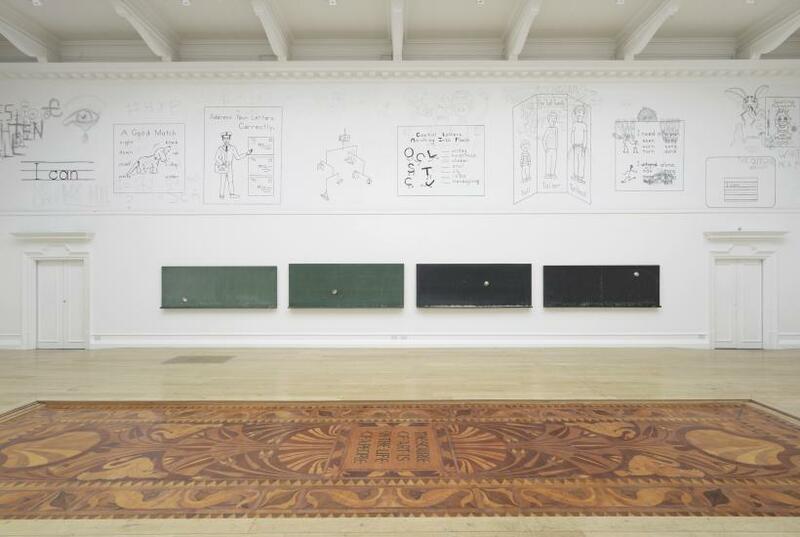 ‘Four Moon Phases’ presents blackboards that link this work to the legacy of Joseph Beuys, as does the use of the oak tree in ‘Event Horizon’. Though it is still to be revealed, perhaps the key event listed for 1986 should be the death of Beuys. Ellen Cantor: Cinderella Syndrome & Carissa Rodriguez: I’m normal. I have a garden. I’m a person.